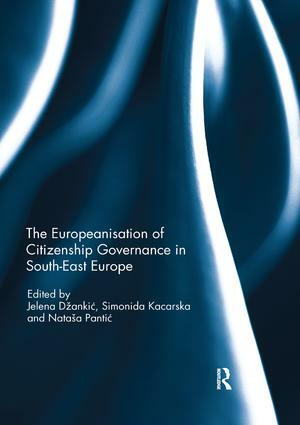 This book looks at how Europeanisation affects the link between citizenship and governance in and across the new states of South East Europe. Contributors unpack the intimate relationship between the European Union, national governments, and citizens through a tripartite model that captures the uneven and diversified effects of Europeanisation on the governance of citizenship-related policy areas. Reflecting on the meaning of governance in different contexts, this book invites the readers to reconsider the terms and concepts that are commonly used for studying the consolidation of new states. By doing so, it directs attention to the transformative power of European integration not only on modes of governance but also on practices and experiences of citizenship. Individual chapters are ‘paired’ to examine three policy areas that are to a different degree affected by the requirements of European Union accession. Combining analysis of policy frameworks with assessment of their impact, the contributors highlight that the impact of Europeanisation can be located on a continuum stretching from ‘strongest’ in matters regarding justice and home affairs, to ‘moderate’ in general issues of social policy, to ‘weakest’ in transforming citizenship through education policies.